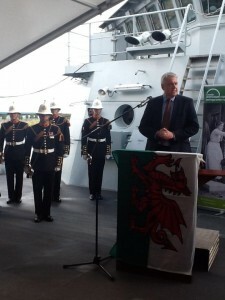 A collaborative project which will see pupils from across Wales create a fitting legacy to commemorate those who served in the First World War, will be launched today by the First Minister, Carwyn Jones with Manon Antoniazzi from the Heritage Lottery Fund and the First Sea Lord, Admiral Zambellas. 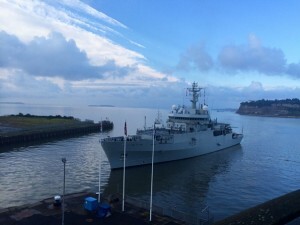 The Wales at War (W@W) project is led by the National Library of Wales, with support from the Welsh Government, the Royal Navy and Heritage Lottery fund. The project aims to produce an online archive of the impact of the First World War on life and communities in Wales via a dedicated platform/app. The project centres on a First World War commemoration activity for schoolchildren in Wales who will use the documentary heritage in the libraries and archives of Wales to develop and publish the biographies of the 40,000 Welsh casualties of the War, with a focus on those named on their local war memorials. The project is a highlight of the Cymru’n Cofio Wales Remembers 1914-1918 programme of commemoration taking place across Wales. The Welsh Government has committed £76,500 to create a Wales at War app, which will include a timeline of the First World War, using maps, statistics, diaries, newspapers, photographs, audio and moving image materials. This information will have a particular Welsh resonance. The app will use the latest technology to show pupils where soldier, sailors and airmen fought, fell and are buried. It will also provide a guide on the conditions that service personnel faced during the war. The app will bring together and support the educational material being produced by the National Library and help pupils in their research. It will also direct users to local archives and record offices and develop training activities using these materials for teachers, families and pupils. The project is also being supported by £85,000 from the Heritage Lottery Fund and £70,000 from the Armed Forces Covenant Fund. “The centenary of the start of the First World War is an opportunity for us all to pay tribute and remember the sacrifice and bravery of those involved in the war. I am honoured to be leading Wales’ programme of commemorative events, Cymru’n Cofio Wales Remembers 1914-1918, a major objective of which is to get our young people to take an active interest in the events and consequences of this conflict. “This special project does just that. So much more than just an education project, Wales at War will use local war memorials to make clear to children the impact the First World War had on their community and engages pupils in local history they can see and visit with their class and family, ensuring the learning experience is wider than the classroom. “HLF has awarded a grant of £85,000 to the National Library of Wales for the Wales at War project. We were impressed by the genuine partnership approach the project has taken and its aim to provide an over-arching resource to record information about war memorials across Wales. Largely led by schoolchildren, it will identify locations, tell the stories and prepare biographies of the names featured on all Welsh War memorials.